Search Rocket.Chat Messages with Chatpal - FREE BETA NOW! Search your rocketchat messages to make your business conversations even more efficient and relevant! Chatpal is fueling your rocket-chat with highly efficient and relevance-focused search.Install the plugin for a free trial. 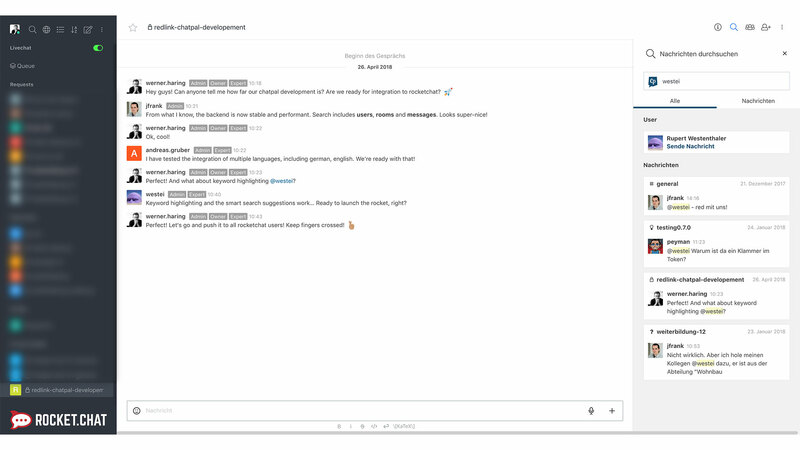 Rocketchat + Chatpal = Easy and efficient digital business communication. You’re using rocketchat for your business communication? Are you sick of scrolling through your chats, searching for the one relevant message to answer your question? Chatpal is here to help you out! We love chatting on rocketchat. And we love working effectively. Thats‘ why we introduce Chatpal: a highly performant search-extension for rooms, people and messages for your rocketchat installation. 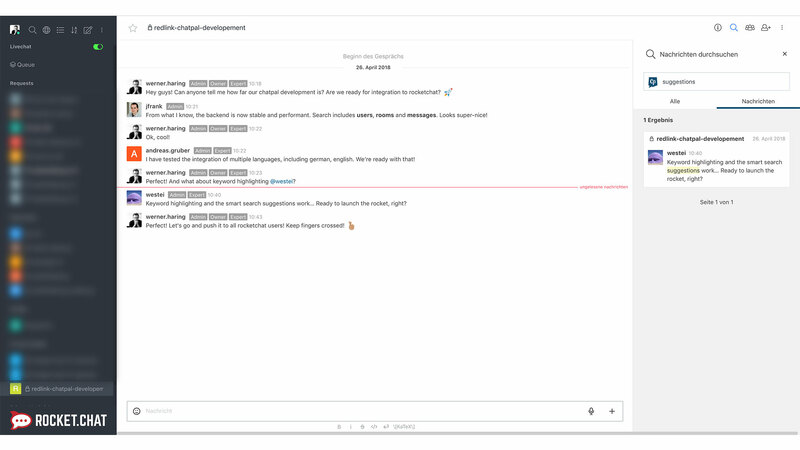 We index your chat to a strong and reliable infrastructure to offer language recognition and processing, smart-suggestions and keyword-highlighting in your rocket chat. A smooth search solution to help you to find the relevant message at the right moment. 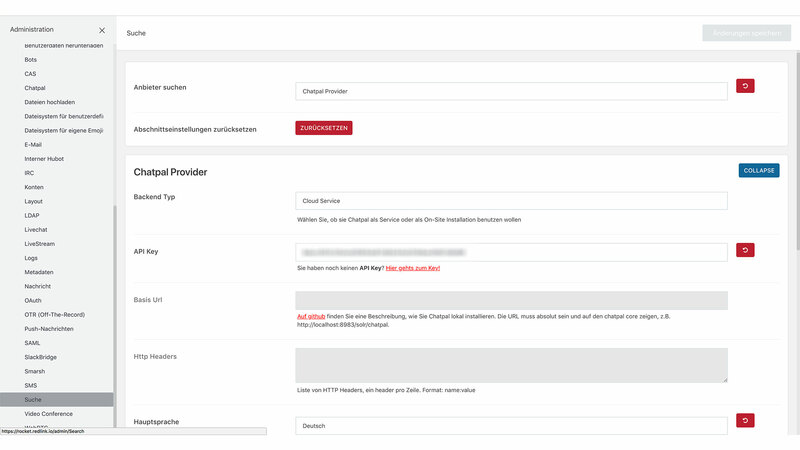 Performant search for users, rooms and messages also in big data environments. Language recognition and processing in a strong and reliable infrastructur. Smart search suggestions and keyword highlighting in well structured search results. And there is even more to come in 2018! 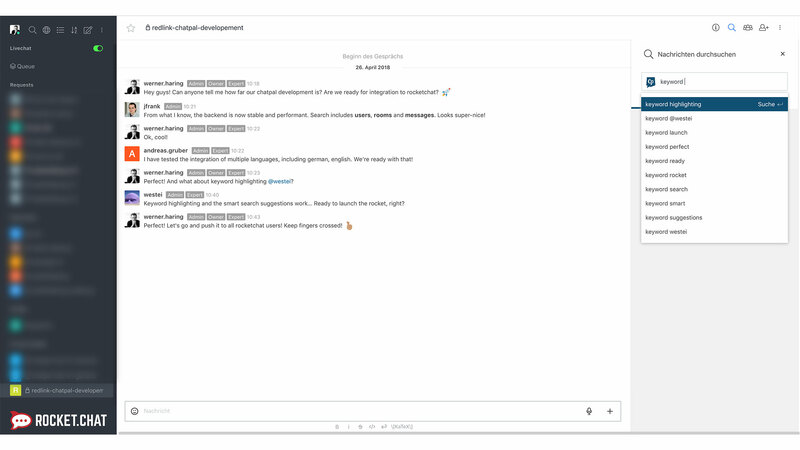 Our fully packed pipeline includes features like smart-snippets for people- or time-filtering, topic recognition and related content suggestions or multi-language support within one rocketchat installation. These features will boost your search-experience even more! Okay, but how can you use this chatpal magic in your business? As we want all chatpal users being happy with their daily team communication tool, we try to offer you the chatpal search-experience in all variations you could possibly need.